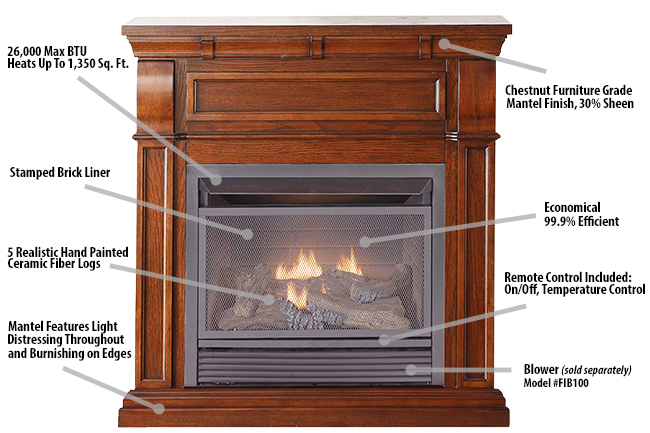 This Duluth Forge Vent-Free Fireplace is simply a beautiful and versatile piece of quality furniture. This Fireplace can live in an antique, modern, bohemian, industrial, minimal, or any other types of homes. The fireplace has been carefully designed and created in a rich golden-brown furniture grade finish with 30% sheen that accents its quality and excellence. Includes many features like remote control functions, Oxygen Depletion Sensor with automatic shut-off, battery assisted piezo ignition, and much more. Using Natural Gas or Liquid Propane, the Duluth Forge Ventless Fireplace radiates heat of 26,000 BTU enough to heat 1,350 square feet of space.